It looked the same, smelled the same, tasted the same. There was nothing in that little jar of oil to distinguish it from any other pure grade, virgin olive oil. The only distinct thing about it was the seal of the high priest, signifying that it was ritually pure. But the Jews insisted on using only the ritually pure oil, and no other, to light the menorah in the Holy Temple, thus precipitating the renowned miracle of Chanukah. “Ritually pure.” What, exactly, is that? What properties does a ritually pure sample of olive oil have that the others don’t? What laboratory tests can be performed to measure degrees of ritual purity? There are none. Ritual purity is a state that has no parallel in the physical universe; it exists solely in the world of the spirit. The Jewish tenacity in adhering to their rigorous rules of purity and impurity drove the rationalistic Greeks berserk. This was why, when plundering the Holy Temple, they defiled every jar of oil that they could get their hands on. The obstinacy of the Jews enraged them. Why did the Jews insist on living in a reality that no one else could see, one that was unverifiable by empirical evidence? Bring a proof, bring evidence that the “pure” olive oil was indeed more refined or superior than the “defiled” oil, and we’ll accept your religious ritual. But the Jews did not and could not offer any earthly evidence that this oil was any different than other oil. All they had was their faithfulness to a standard that existed purely in the realm of spirit. Mind you, the Greeks were not strangers to the world of the spirit. They had their own finely developed culture with drama, art, philosophy and religion, rivaling anything in modern times. But their aesthetic had a certain logic to it; it appealed to human instincts. The Jews followed rules that did not conform to any human system of thought. They unapologetically declared their allegiance to a Master who was above human logic and understanding. I do the best I can to answer these questions truthfully and intelligently. But before I can formulate an answer for someone else, I must turn to myself first and ask, why? Why, indeed, do I follow these laws? What compels me to observe Shabbat, eat only kosher, or maintain the intricate laws of family purity? As I question myself, I realize that all the beautiful, eloquent explanations I find do not really express the core reason for why I keep the commandments. Not that those answers are not truthful; they are all absolutely sincere. Shabbat is truly a magnificent experience, a day that nurtures me and gives me strength to cope with the week to come. Keeping kosher helps me be more mindful of the act of eating, and elevates all my physical functions to a higher plane. Observing the laws of modesty enhances my relationship with my husband and brings us closer together. But none of these reasons really explain why I keep these laws. What is my real motivation, the “why” behind my observance? It’s a sentiment that is not very easy to articulate, especially to a slightly mocking stranger. It sounds almost uncouth, too raw and unsophisticated to declare that I observe Jewish laws because I am a Jew, and G‑d commanded me to do so. As a 21st-century Jew, I am still battling an inner foe, a modern incarnation of the ancient Greek who derides open displays of faith. That inner Greek is comfortable with rational, cultural or psychological explanations for the commandments. Observance based on faith sounds scary and out of touch with modern-day reality. But that’s the whole point—as Jews we’ve never been in touch with everyone else’s reality, modern or otherwise. Being Jewish means having a connection with a reality that’s out of view of the physical senses: a reality in which the difference between pure and impure, kosher and non-kosher, Shabbat and weekday, is self-evident and intuitive. The miracle of Chanukah that we commemorate each year is a celebration of that essential connection we have with that which is beyond reason. As I said, it’s not easy for me to express my faith in words. Words are for communicating thoughts, concepts, philosophies. Words are what we use to bridge the gap, when my reality is different from yours. But the faith that is in me, my soul-bond with G‑d, is the same as in you. Mitzvot are not a philosophy; they are our life, our essence. That’s why mitzvot can’t really be explained. They need to be felt, experienced, through tangible physical acts. Like laying tefillin. Or placing a coin in a charity box. Or lighting a candle. That’s another “why” question that Chanukah often invokes. It’s such a warm little holiday, a nice alternative to all the commercialized glitz out there. We can celebrate at home, share latkes and jelly donuts, play a few rounds of dreidel and sing Maoz Tzur. But why all the publicity? Why the huge menorahs and celebrations? Why does Jewish law stipulate that we must light the menorah by either the window or the door, at a time of night when passersby are likely to see it? The answer is really the culmination of all of those “why” questions: because it’s not enough to hold my faith hidden deep in my heart like a treasure. It can’t just remain “up there,” in the spiritual realm. It needs to be expressed and articulated; it must find a home within the physical, commonplace world. We kindle the Chanukah lights in public to make a proud statement to everyone, curious strangers and mocking Greeks alike: We are the Jewish nation, and we are here to stay. These lights will pierce through all worldly darkness, and will never be extinguished. 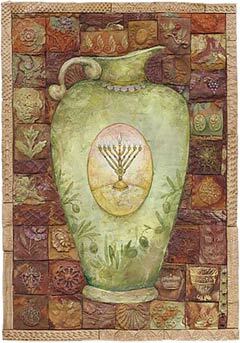 Illustration: Mosaic by Chassidic artist Michoel Muchnik. not all Your essay is clear and very informative. However, I have many Jewish friends with children, but when it comes to religion, it is not a big part of their life. They identify as Jews no problem. But they are secular, not religious. Then you toss in Israel where the Jewish population is secular by majority. Where it was the secular leadership that was mostly responsible for the creation of the State in 1948. I am not arguing against Chanukah or pure virgin olive oil or public menorahs. Call me weak kneed, but I prefer to keep my belief in G-d in conversations away from my friends in order not to alienate them. Religious appreciation doesn't register on their radar and I don't see it as my responsibility, even if this contrary to some commandments. I am still short a mezzuzah or two on my inner doors, physical and spiritual. I applaud you for being pious and wanting to share your religious beliefs with others. More power to you. The key I think is that on levels higher than our material eistence "why" is not something which is found in "logical deduction". The mystical aspects of g-dliness which are only revealed in the subtle Daat [knowledge] of HaShem's truth are perhaps closer akin to the "why" Chaya is trying to express. The reasons we find for things in our world may well have higher reasons in worlds above ours.